New details surfaced on Monday about the robot used to kill the suspect in a shooting rampage last week, the Dallas Police Department states in an official statement on twitter. 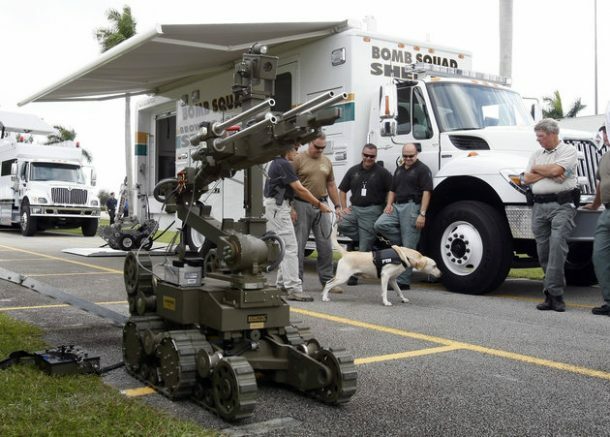 The robot was identified as Remotec Andros Mark V-A1 and was used to neutralize a suspect who opened fire during a Black Lives Matter protest that killed five officers and injured many more. Mark V-A1 was originally designed to be used for bomb disposal, though it was used by the Dallas police last week to deliver an explosive instead. Although it serves the basic purpose of a robot, that is to assist human beings and keep them out of dangerous situations, there are certainly some practical and ethical concerns when deploying such high-tech weapons. The Andros Mark V-A1 made by military tech company Northrop Grumman is equipped with a surveillance camera and an extendable arm with a “gripper” that can also rotate. It can be controlled remotely and is also capable of climbing up stairs. In the latest incident, its gripper was used to deliver a C4 explosive, which was detonated by the police to kill the suspect. According to Dr. Robert Latiff, an ex-Major General of the United States Air Force, now serving as a technology expert at the University of Notre Dame, a non-lethal option was never an option in this scenario. According to him, the police did not have a lot of time – as usually is the case in such shooting incidents – and in that combat situation they took the right decision. He maintains that the Mark V-A1 is a tool like any other machine. It is not an artificially intelligent machine taking its own decisions. But instead, it was simply a means used by a police officer in order to neutralize the perpetrator. Although Mark V-A1 is no more a robot than your television is, but Illah Nourbakhsh, a professor of robotics at Carnegie Mellon University, begs to differ. He is concerned by the fact that ignoring the greater implications of this technology’s deployment could be disastrous. In his opinion, such robots in the future will have only grow more capable, opening provision for activities never dreamt of before. There are ethical concerns, he added. Since currently there are no ethical laws, guidelines or checks and balances for killing with a ‘bot’, there are some legislative and ethical gaps to be filled before catering this issue. What is your opinion on using robots for the matter of life and death? Is the legislative and ethical gap too great to hinder application of robots in such scenarios?